The science program as well as the abstracts for this year's DPS meeting were posted online a few weeks ago. DPS 2009 will be taking place in Fajardo, Puerto Rico, and as such, I won't be going. Hopefully the organizers will be able to broadcast the meeting oral sessions like they did for last year's meeting, but I guess that will depend on the infrastructure at the El Conquistador Resort. The webcasts last year allowed me to post about each of the Io talks here on this blog. The 2009 Meeting of the Division of Planetary Sciences will be held between October 4 and 9, 2009. The first talk of the Galilean Satellites session is titled, "Strong Tidal Dissipation In Io And Jupiter From Astrometric Observations" and is by Valery Lainey et al. The talk will summarize their results from examining astrometric data of the Galilean satellites over the last century and what the motions of these moons tell us about the rate of tidal dissipation within Io. 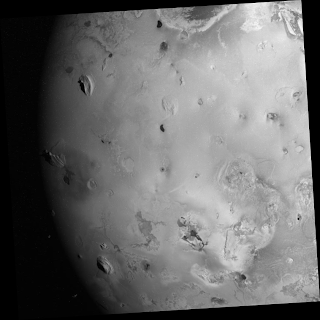 They found that the dissipation rate is on the same order as Io heat flow, suggesting that Io is in thermal equilibrium. These results were published in a paper in the journal Nature earlier this year and were discussed in more detail on this blog then. The next talk will be by Daniel Allen and Jani Radebaugh and is titled, "Temperature and Variability of Three Ionian Volcanoes." The authors examined the brightness and color temperature of three volcanoes on Io (Pillan, Wayland, and Loki), observed by Cassini's narrow-angle camera during several eclipses during the New Year's 2001 Cassini encounter. The abstract and talk provide an update to the results presented at this year's Lunar and Planetary Sciences Conference back in March, including updated temperature estimates for the three volcanoes. They found a cooling trend for Pillan and Wayland, suggestive of a cooling lava flow, as well as an apparent shut down of a vent at Wayland during one of the eclipses. Loki was found to be more variable, consistent with an active lava lake. John Spencer et al. will present the next talk in the Galilean satellites session, titled, "Changes in Io's Atmosphere in 2009: Atmospheric Inflation Near Perihelion?". During his talk, Spencer will present spectroscopic observations of Io's atmosphere acquired in June 2009 which suggests that Io's atmosphere undergoes an increase in column density (the amount of gas over a given area on Io's surface) as the Jupiter system approaches perihelion. This would be the result of increased sublimation of sulfur dioxide frost from Io's surface from the increased surface temperatures. The vapor-pressure equilibrium relationship between SO2 surface frost and atmosphere SO2 gas is sensitive enough that even the 5.6 K temperature difference between aphelion and perihelion is expected to produce a 7x difference in atmospheric SO2 vapor pressure. This data was also discussed in more detail by John Spencer in June in the Planetary Society Blog. The final Io talk in the Galilean satellites session will be presented by Jessica Lovering and is titled, "Analysis of the New Sodium Emission Feature Discovered in Io’s Wake". The discovery of this Jupiter-ward sodium jet was presented at last year's DPS and was discussed to an extent on this blog then. The Io poster covers the Io Decadal Survey White Paper and will be presented by David Williams. The two white papers were discussed on this blog earlier. EDIT 09/19/2009 4:17 pm: Fixed links to abstracts...hopefully... If you are having trouble with the links, just go to the two sessions with Io talks and posters and click the links their for the abstracts: Galilean satellites oral session and Decadal Survey White Papers poster session.